Sometimes wondering, being curious is a good thing. When it’s all you think about, that’s when it becomes a problem. Slowly etching it’s way into your mind until you’re consumed by it. That’s me. Wondering, if I can get better in time to be allowed back into school. Wondering if he still feels the same way that he did a few weeks ago. Wondering what in the hell I am going to do with my life. Where am I going? What am I doing? Am I going to be someones role model? Will I benefit the world some day? 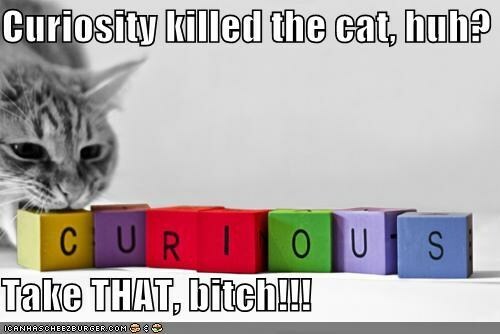 They say curiosity killed the cat. They have nine lives right? So if they died, they were just too stupid to correct their mistakes. I’m trying my damnest to correct mine. I don’t want to die wondering and full of what if’s. I want to die happy, satisfied with my life. This entry was posted in Life in General and tagged curiosity killed the cat, curious, life., satisfied, what if, wondering on June 13, 2013 by anonycollegegirlmous.